The NFIWADS database contains aggregated results for the German National Forest Inventory (NFI) plots based on process-based water balance simulations. 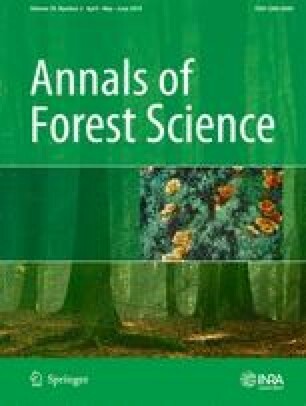 More than 150 water budget, soil moisture, and drought stress indicators were derived for mature, closed-canopy beech and spruce stands, and provide a basis for the assessment of forest productivity and risks. Dataset is available in the Open Agrar repository (Schmidt-Walter et al 2018) at https://www.openagrar.de/receive/openagrar_mods_00044576 . Associated metadata is available at https://metadata-afs.nancy.inra.fr/geonetwork/srv/fre/catalog.search#/metadata/2f09d81c-b663-48a0-8b84-0b247bba6d35 . Paul Schmidt-Walter created the databases and supplementary material, and drafted the manuscript. All co-authors contributed to the writing and the design of the database. Henning Meesenburg and Tobias Mette additionally supervised the research project. We thank Thilo Wolf (FVA-BW) for the fast and uncomplicated provision of huge amounts of daily resolution climate data and the Federal Office for Agriculture and Food for the project sponsorship. The database was created within the project “Forest productivity, carbon sequestration, climate change” which was funded by the Forest Climate Fund supported by the Federal Ministry of Food and Agriculture and the Federal Ministry for the Environment, Nature Conservation, Building and Nuclear Safety by decision of the German Bundestag (project no. 28WC4003). The authors declare that they have no conflict(s) of interest. Federer CA (2002) BROOK 90: A simulation model for evaporation, soil water, and streamflow. http://www.ecoshift.net/brook/brook90.htm. Accessed 2 Dec 2018.